As a pet parent, keeping your dog's teeth and gums healthy goes beyond making sure they have a dental cleaning every year. Vetoquinol Dentahex Oral Care Chews for Dogs contain Chlorhexidine – an effective ingredient that helps control plaque and tartar (calculus). Our delicious beef hide chews clean your dog's teeth and fight bad breath by reducing bacterial buildup that may cause oral health issues. Contain Chlorhexidine which works as a natural antiseptic to help reduce harmful bacterial growth that may lead to oral health issues. Made of 100% natural beefhide and has an abrasive texture that provides a natural abrading action to scrape away plaque and tartar buildup on teeth and at the gum line. What are the risks of poor dental hygiene in dogs? Serious tooth and gum problems can occur when plaque builds up on the surface of your dog's teeth. Where does plaque come from? Tiny food particles combine with bacteria to form plaque and can lead to gum disease. The bacteria in plaque causes inflammation and eventually destroys the tissue around the teeth that keeps them healthy. This can cause mouth pain, tooth loss, and other issues that can shorten your dog's life expectancy. 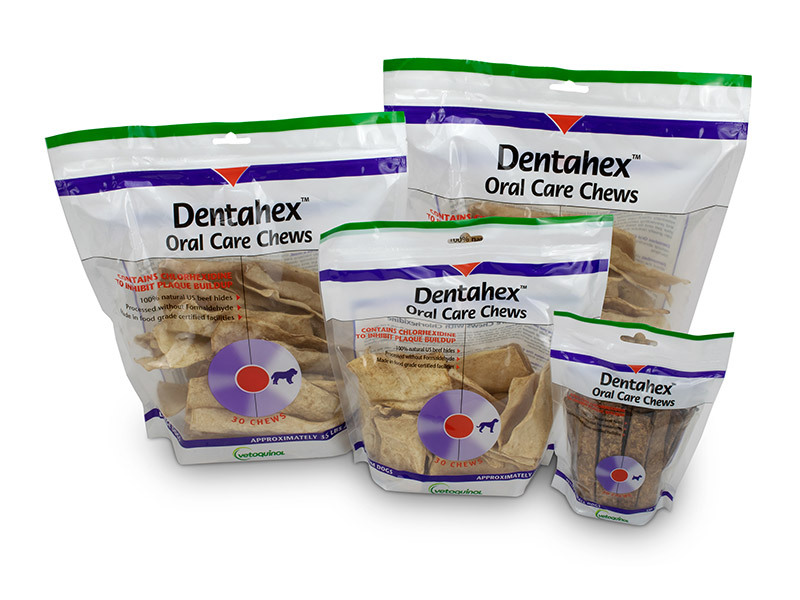 Good dental hygiene practices, like giving your pet Dentahex Oral Care Chews, helps remove food particles before they develop into plaque. More than 80% of pets age 3 years or older have serious tooth and gum problems. In pets, two-thirds of each tooth is hidden inside the gums. Your pet may have dental issues you're not able to see. 30-count bags for petite/small, medium, large, and extra large dogs. Beefhide, Corn flour, Poultry digest, Maltodextrin, Caramel coloring, 0.12 Chlorhexidine Gluconate. Consult your veterinarian before giving your pet Dentahex Oral Care Chews. Follow the recommended administration on the package, unless otherwise instructed by your veterinarian.